I think Stephen Curtis Chapman is one of the greatest songwriters of our time. His songs reach into your soul and yank at your heart. I watched this clip last night after I got home from Stations of the Cross...talk about incredibly moving. 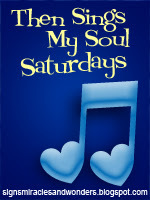 You're invited to visit Amy and see what other songs are in people's hearts on this Saturday. I agree! Stephen Curtis Chapman is a great songwriter. My friend, Rebecca Jo, absolutely loves SCC as well. In fact, I think she's a little obsessed with him. She posted the funniest picture of her, at one of his concerts, near the stage and pointing up to him (he was standing on a different part of the stage and didn't see her). He just amazes me...the way he handled his daughter's death. God is working in his life, that's for sure. I love Stephen Curtis Chapman, he is one of my absolutely favorite artists. I have at least six or seven of his CD's. I also really like Michael Card, do you ever listen to him? Ditto! And, he seems like such a normal family guy. I like that. Wow! Haven't heard that one before. I watched part of The Passion last year. How He loved(s) us. I enjoy SCC's music, and I really do appreciate that we have the Stations of the Cross during Lent at our parish.